Yes, the Earth's Internet is also Wireless! 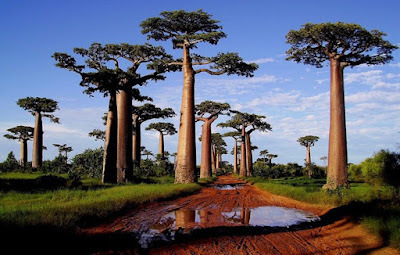 U.N. Environmental Programme: "Forests charge the Earth's magnetic field"
But do trees really effect the electrical conductivity between the negatively charged ground on earth and the positively charged sky and atmosphere above us ? Yes!! Actually I have for a long time suspected something could be connected here, but not just with trees, but all vegetation on Earth in every type of ecosystem to a degree have the ability to transmit a measure of electrical charge into our atmosphere and what we do know is that it does effect weather patterns. But again, the electromagnetic field ? I think more work has to be done into looking into this. In these later day modern times there is a lot of popular junk science, US Government X-Files Conspiracy Stories and any amount of New Age speculations of Aliens wanting to help us. I usually run for the door when the conversation takes this type of turn. But even still, there is an element of the unexplained and we already know science doesn't know everything, but that learning is an ongoing venture and always will be. Still it's a nagging question. Let's discuss what science has already discovered and knows about trees, shrubs, plants and other vegetation's ability at conductivity. But back to the subject title at hand. Can forests from all around our Earth's various ecosystem actually contribute to recharging and maintaining the Earth's Electromagnetic Field ? Again I'm not so sure, but it's possible given the facts that we do know of it's ability to actually effect and influence all global weather patterns and cloud formation itself. This includes Plankton in the Seas. Aside from emitting chemical compounds into the atmosphere, trees and shrubs also carry an amount of electrical conductivity and emit negative electrical ions into the atmosphere as well. Think of all healthy vegetation withing any diverse plant community's ecosystem all cooperating ed together and fulling charged through a very sophisticated grid of various deeper tap rooted foundation forest trees, lateral roots of all types of plants intertwined with each other and further connect to one another by hundreds of forms of both Ecto & Endo mycorrhizal connections. All all of this cooperation causes an amazing anomalous effect of Thunderstorm creation with all the right weather component conditions in place. 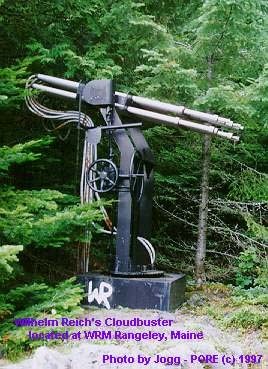 Before I show some examples of technologies being developed to take advantage of trees ability to generate a small measurable amount of electrical charge to operate small devices, let me show you an illustration or rather photo of a rather primitive type of invention by one very bizarre yet intuitive individual Wilhelm Reich. Now normally I steer clear of the groups that discuss his work and research. Many of his fans and present day followers are of a New Age persuasion which is something I don't gravitate towards. Anytime some wants to talk to me about meeting Angels, Spirits or Aliens or UFOs that only want to help humankind I generally run the other way. When someone wants to talk about healing powers with Crystals and other such, again I'm not interested. Why these folks go this direction and discredit what could be an otherwise interesting naturally occurring phenomena I don't know. 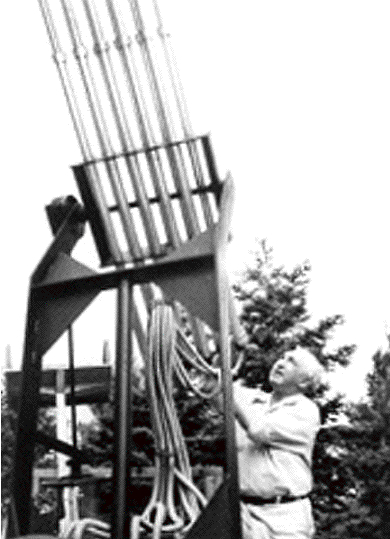 Anyway, here is Wilhelm Reich's invention and it is called a "Cloudbuster". This device was said to be able to create or break up clouds or cloud cover in the sky depending on how it was used. Reich claimed there was what he coined or phrased, "Orgon Energy" which emitted from the Earth which as I interpret it was basically some sort of electrical conductivity extracted from the Earth perhaps in the form of a type of electrolysis which was then released and channeled through those 15' tube conduits at a specific direction in which the device was aimed towards the sky. Interestingly, this man was followed and harassed by the United States investigative arm called the FBI. There is actually a museum dedicated to this man and his research up in the state of Maine. Here are a couple of links dedicated to the man and his research. You also may not be aware that Pop Singer Kate Bush of Britain and well known actor Donald Sutherland did a song video of Wilhelm Reich with his Cloudbuster/Orgone research work and trouble with the US. Government. This next link is from a true documentary of Wilhelm Reich and his lives work destroyed by the U.S. Government. Take it for what it's worth, this actually happened. Finally here is the website of Orgone Research Lab of Prof James DeMeo who makes probably the best case sense for describing all of Reich's work, though I may not agree with all of it, but you decide. 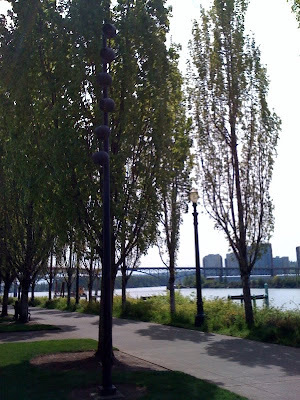 There is no argument that trees and shrubs do carry a measure of electrical current through their live woody tissues. Whether you choose to called it electricity, Orgone Energy, Ormus, Electrolysis - whatever, something is nevertheless present. Here is a link to a page I've created documenting much of the research on Scientific findings on electrical energy from trees being Bio-harvested and the technology for doing so. 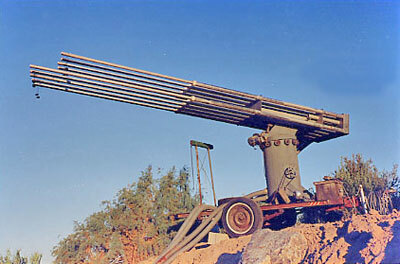 Now for the moment, take a long hard look at this apparatus of Dr James DeMeo's which I believe is on the banks of the Colorado River near Blythe California, but on the Arizona side. While I may be somewhat skeptical on this things ability to create or destroy clouds, there are some remarkable features about this somewhat primitive technology which is carried out and still studied today and it made me take serious notice. The features of this device reminded me of various major componants of a tree. The strong stout frame which looks like the trunk of a tree. The 20 or so 15' metal tubal conduits which reach towards the sky like branches and whether or not you'll noticed them, each tube is connected to a large flexible steel hose which are all filled with vacuum sealed energized water which is then run down a well or down into a lake to capture the electrical conductivity from the Earth by means of water. Those flexible tube-like hoses reminded me of a trees root system. 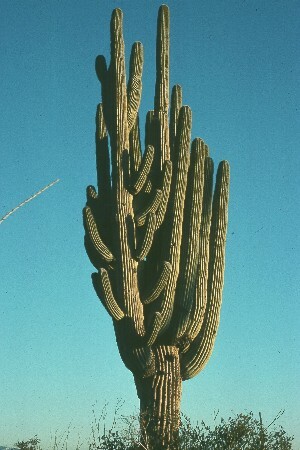 It appeared to me that there are many plants in the natural world with similar features as the human inventions for interacting with and manipulating the weather and climate. 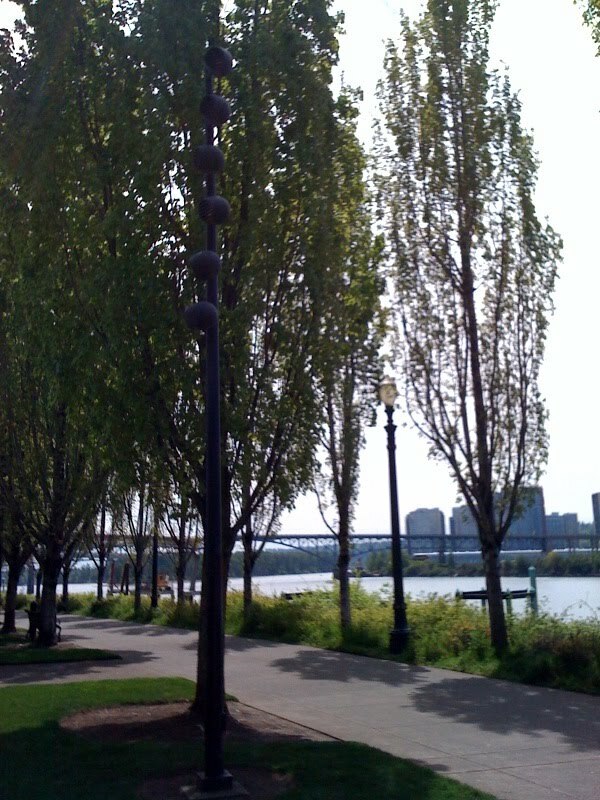 Take a look at some of these plant structural designs of mature trees and see if you don't agree ? 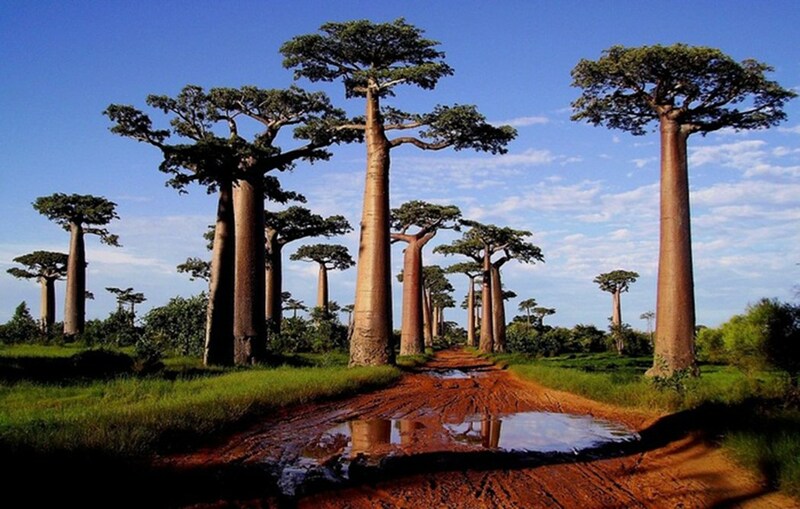 Then we have the classic Design of the Baobab Tree in Madagascar which actually looks identical to those $17,000,000 Weather Cloud formation Towers installed by the Swiss Company Mateo systems International in Dubai for creating rain on the Arabian Peninsula. This takes me to some other modern Biomimicry technology which copies the original of weather modification found in nature. All forests have this ability and much came to light last year in January of 2011. Take a look at the Weather Modification Headlines from outside the city of Abu Dhabi where a Swiss Company called Meteo Systems International claims it has created these thunderstorms. Take a close look at the artist's conception of the strange yet familiar shaped towers used by Meteo Systems International who made claim to making it rain in Dubai in 2011. Now all of the articles that came out with this amazing claims of creating rain and thunderclouds were all pretty vague as to how they did it. You couldn't find any real info anywhere as it seemed to be pretty much keep under the lid, even by the Dubai government who spent over $30 million on the project. However, I researched and dug up an online Patent search which revealed the technologies used. Basically they copied nature, or at least they tried to. Take a look. "The present invention provides an apparatus for weather modification. The apparatus comprises an emitter electrode, means for providing the emitter electrode with an electric charge, electrically coupled to the emitter electrode, an insulating support for supporting the emitter electrode at a predetermined height, and means for earthing the apparatus. The emitter electrode comprises a Malter film. 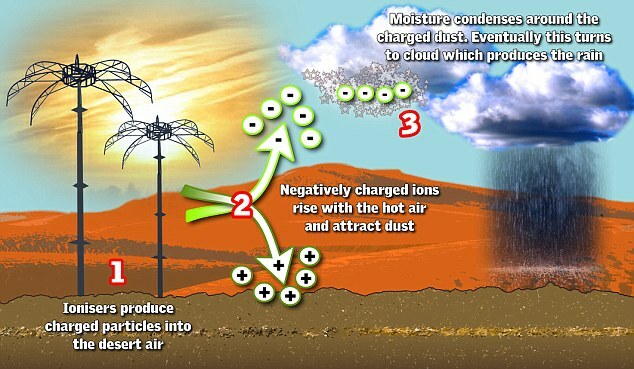 According to another aspect of the present invention an apparatus for weather modification is provided, which comprises a lighter-than-air craft suitable for carrying an emitter electrode, means for providing the emitter electrode with an electric charge, electrically coupled to the emitter electrode, and means for earthing the apparatus. According to still a further aspect of the present invention, a method of increasing the amount of precipitation in a target region is provided. The method comprises the steps of providing an emitter electrode, analyzing the meteorological situation in and/or close to the target region, and providing the emitter electrode with an electric charge in response to the meteorological analysis, thereby causing the emitter electrode to ionize the vicinity of the emitter electrode." As you read further on, why low and behold they also used the release of several types of aerosols up in the atmosphere. Sound vaguely familiar ? Yet most folks do not understand that the technologies being used in modern weather modification are exact copying of the reality of what exists in all forests operating through a healthy complex sophisticated underground grid system which channels Earth's deep energy to the surface. Sadly like anything else, some of this technology is being enhanced and being abused and misused for other purposes. This isn't a subject I choose to get into, but folks should know that such technologies are being altered and enhanced for weapons research. I believe there are enough websites out there dealing in controversy and government conspiracies, but you should be aware that there is some element of truth to these accounts. The USA Government's Air force is behind research in Alaska involving a controversial HAARP Project. I'll let you read and decide for yourself what they themselves say about their own motives in this area. 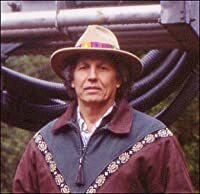 This next link deals with an individual named Dr Nick Begich , Executive Director of the 'Lay Institute of Technology Inc, a Texas non-profit corporation, who worked and presently lives in Alaska and wrote a book called "Angels Don't Play This HAARP" If you are going to watch this video below, please give yourself 117 minutes of time set aside as it is a long yet informative documentary. This HAARP Movie Will Blow Out The Way You Look At Current Environmental And Weather Events. My point here is NOT to be directing attention to government conspiracies or misuse and abuse of technologies based on biomimicry of something observed in the natural world. You need to understand just how Earth's underground internet works whether in the wild, the urban landscape or your own backyard organic gardening projects. There are also a lot of good that can be copied from the observations we see in nature. Hopefully responsible readers here will apply those techniques and make practical applications towards a healthier and more successful natural world. Back to the original article's question and speculation of whether or not Forests and all other vegetative ecosystems on our planet having the ability of continual enhancement and recharging of our Earth's Electromagnetic field, I still don't know the answer to that as far as to any certainty. However they do effect our immediate global atmosphere and there is no doubt that some of the various extreme weather patterns and even increase in intensity of global Earthquakes we are experiencing presently is a direct result of not only deforestation, but of general vegetative habitat destruction of all types, be it mechanical removal or by means of massive forest fires on the rise. Yet as far as the question, the more we learn about the sophistication with which this planet's ecosystems are put together no matter how one chooses to believe in how it all originated, there is no doubt as to a huge possibility that plants can effect even the Earth's electromagnetic fields protecting us. More reasons here to pay close attention. Ultimately while I am intrigued about what these ecentric people observed in nature as far as possible natural phenomena they may have been trying to replicate, I reserve caution as well. More later on my personal experiences and observations in Anza California of my personal observations of that areas forest & chaparral ecosystem's influence on cloud formation during the regular yearly monsoonal flow seasons so characteristic of the Southwest regions of the United States! Thanks, I've since update the article. Alot has happened since.